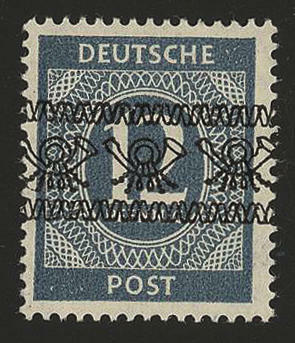 6693 36/51IDD 2-84 Pfg. 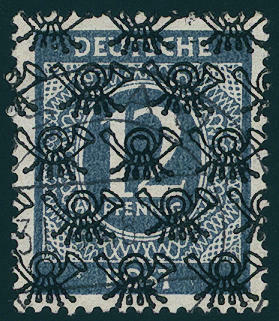 Worker with double overprint, all 17 values including the light 60 Pfg. 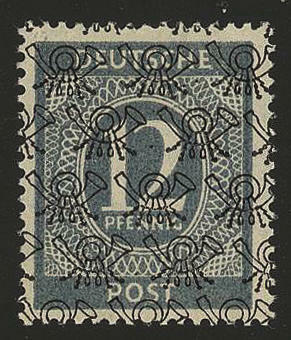 Complete, fresh colors and in perfect condition mint never hinged In this completeness rare offered! Photo expertize \"the quality is perfect\" Hans-Dieter Schlegel BPP. 6694 36/51IIDD 2-84 Pfg. 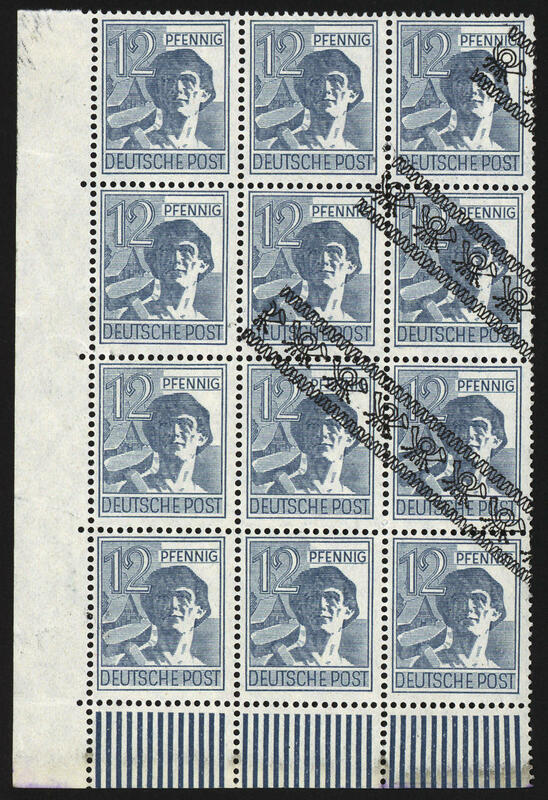 Worker, all 17 values complete with double overprint including the light 60 Pfg., fresh colors and in perfect condition mint never hinged, in this completeness rare offered, photo expertize \"the quality is perfect\" Hans-Dieter Schlegel BPP. 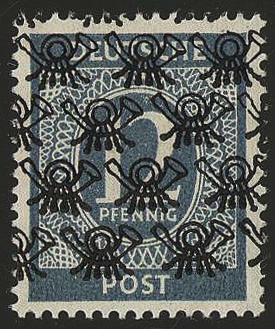 6695 36IU 2 Pfg. 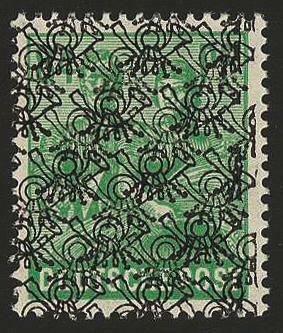 Worker with overprint, vertical pair unperforated, in perfect condition mint never hinged, without any signs. Michel 400,- €. 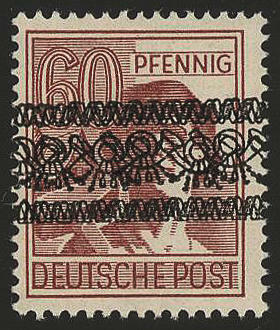 6696 37IFI 6 Pfg. 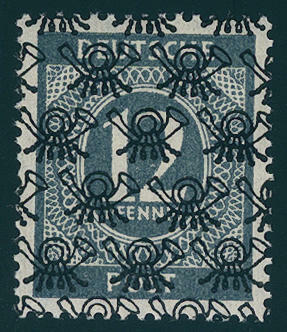 Worker with overprint in dark blue, fresh colors and very well perforated, in perfect condition mint never hinged stamps with overprint in this color error were only in Bonn sold. An American/British Zone rarity! Photo expertize \"the quality is perfect\" Hans-Dieter Schlegel BPP. 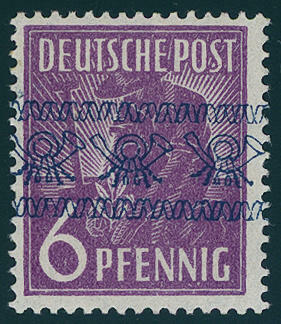 6697 37P 6 Pfg. 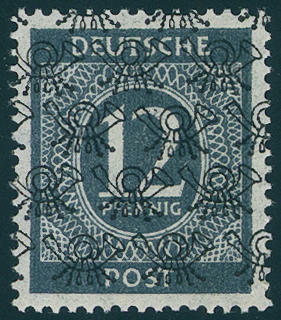 Worker with moirê lines overprint, the scarce proof, fresh colors and in perfect condition mint never hinged, expertized Schlegel BPP. Michel 900,- €. 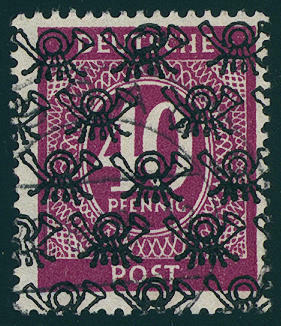 6698 40IDI 12 Pfg. 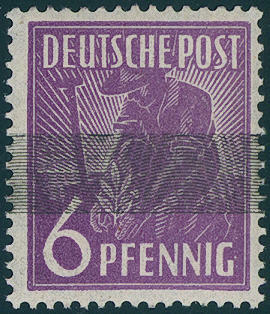 Worker 1948, corner margin block of twelve lower left mint never hinged extremely strong shifted diagonally overprint, through it five values without overprint, as well part overprints. Impressive unit, in this kind unique! Photo expertize Schlegel BPP. 6699 ⊙ 42IIc 16 Pfg. 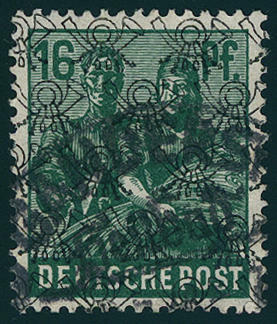 Blackish opal green, the scarce colour with net pattern overprint, fresh colors and neat cancelled, photo expertize \"genuine and immaculate\" Andrew Schlegel BPP. Michel 400,- €. 6700 46DDFI 30 Pfg. 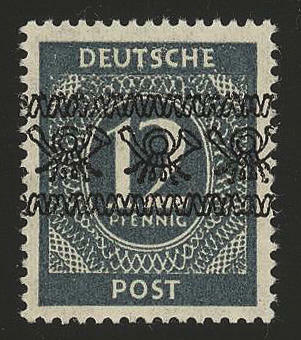 Worker with double overprint, once normal and once diagonal, in perfect condition mint never hinged, twice signed Schlegel BPP. Michel 180,- €. 6701 ✉ 49I,A49I 60 Pfg. Worker, both colours fresh colors and in perfect condition (the good lightly 60 Pfg. 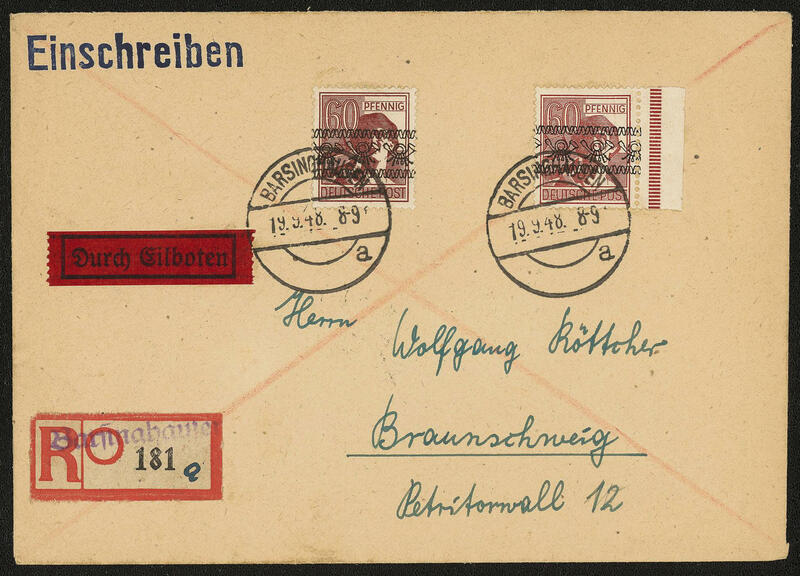 From margin of sheet) on very nice, correctly franked special delivery registered cover from \"BARSINGHAUSEN 19.9.48. 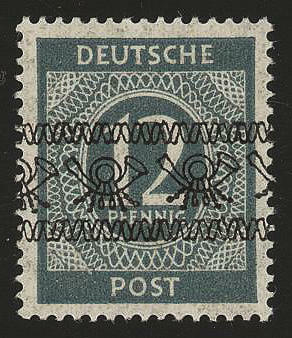 \" to Brunswick with arrival postmark. 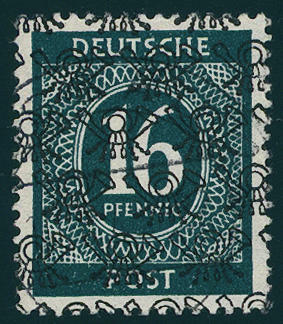 An attractive and very scarce combination! Photo expertize Hans-Dieter Schlegel BPP. 6702 ⊙ 49Ia 60 Pfg. 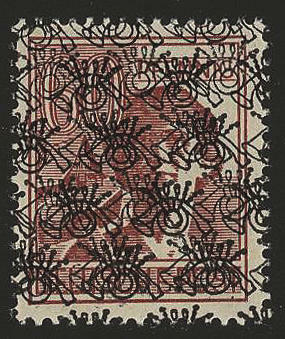 Brown carmine with overprint, neat cancelled \"Hanover\", expertized Schlegel BPP. Michel 300,- €. 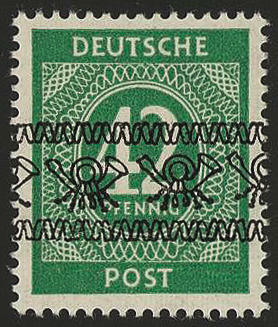 6703 ⊙ 49Ia 60 Pfg. 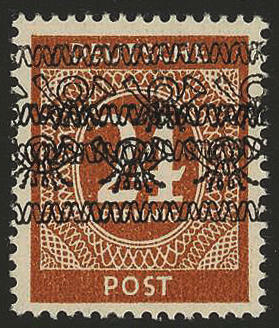 Brown carmine, overprint, fresh colors and neat cancelled, expertized Schlegel BPP. Michel 300,- €. 6704 49IDK 60 Pfg. 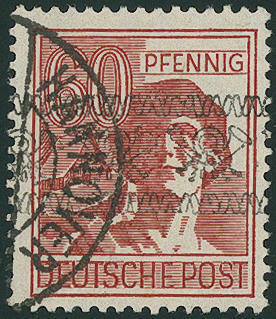 Brown carmine with double overprint, of it one inverted, fresh colors and in perfect condition mint never hinged, expertized Schlegel BPP. Michel 380,- €. 6705 ⊙ 52/67II 2-75 Pfg. 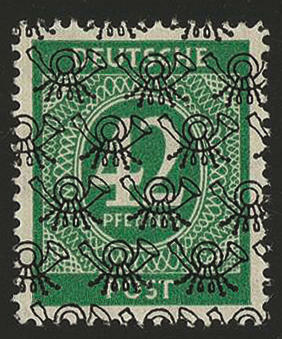 Numerals with net pattern overprint, fresh colors and neat cancelled in perfect condition, expertized Schlegel BPP. Michel 3000,- €. 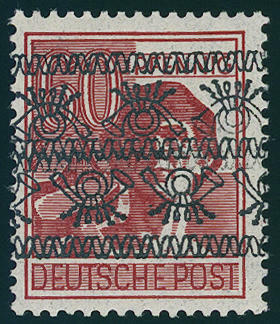 6706 52/68,I-IX/I-II 52 values numeral with ribbon and net pattern overprint, fresh colors, very well perforated and in perfect condition mint never hinged, four newest photo certificates \"the quality is perfect\" Hans-Dieter Schlegel BPP. Michel 3000,- €. 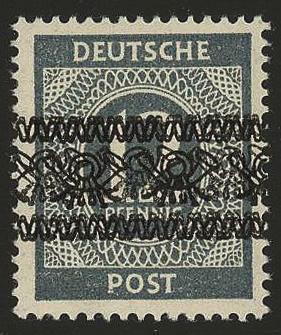 6707 52/68,I-IX/I-II 52 values numeral with ribbon and net pattern overprint, fresh colors, very well perforated and in perfect condition mint never hinged, four newest photo certificates \"the quality is perfect\" Hans-Dieter Schlegel BPP. Michel 3000,- €. 6708 52/68I 2-84 Pfg. 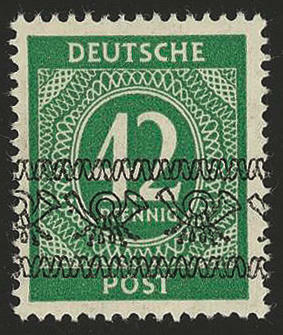 Numeral, all 17 values with overprint, fresh colors and very well perforated, in perfect condition mint never hinged, new photo expertize \"the quality is perfect\" Hans-Dieter Schlegel BPP. 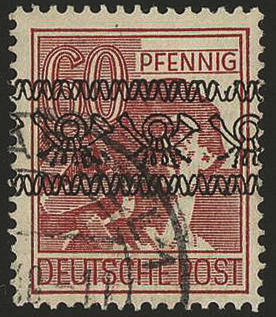 6709 52/68IDD 2-84 Pfg. 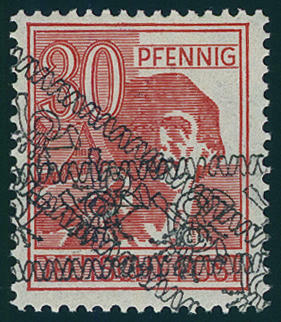 Numerals with double overprint, all 17 values fresh colors and very well perforated, in perfect condition mint never hinged, a scarce set, photo expertize \"the quality is perfect\" Hans-Dieter Schlegel BPP. 6710 52/68II 2-84 Pfg. 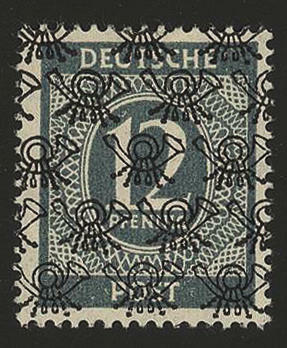 Numerals with net pattern overprint, fresh colors and in perfect condition mint never hinged, expertized Schlegel BPP. 6711 52/68II 2-84 Pfg. 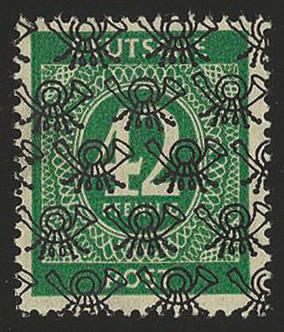 Net pattern overprint, all 17 officially issued values, fresh colors and in perfect condition mint never hinged, expertized Schlegel BPP. 6712 52/68II 2-84 Pfg. 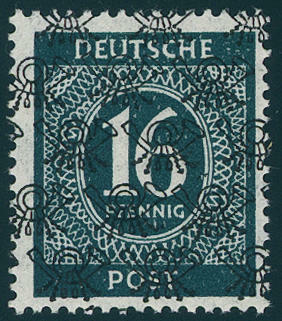 Numerals with net pattern overprint, all 17 values fresh colors and very well perforated, in perfect condition mint never hinged, new photo expertize \"the quality is perfect\" Hans-Dieter Schlegel BPP.